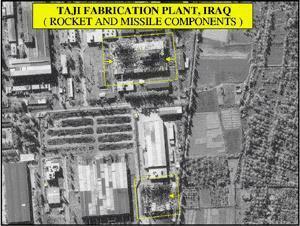 Taji, located 30 km North of Baghdad, was the primary location for Iraq's indigenous long-range missile program. Activities included air frame design, construction and modification, and liquid fuel rocket engine development and production. UNSCOM teams destroyed prohibited missiles, support systems, development and construction equipment, and specialized tools and dies. Iraq was planning to build a 1,000-machine production centrifuge cascade at Taji. Based on performance achieved by the Iraqis with their prototype centrifuge, IAEA estimated the potential output of a 1,000 centrifuge cascade at about ten kilograms of weapons-grade highly enriched uranium annually. Project 144/2 (Mustafa Project) Production and modification of SCUD/ Al Hussein class missiles (airframes, warheads) Most buildings were damaged or destroyed during the war. No actions were taken by UNSCOM to destroy the infrastructure. The facility was abandoned, and used as a storage area for some items under on-going verification. According to Iraq, all CW agent production plants were located at the Muthanna State Establishment (MSE). Iraq declared that all CW agents were produced only at MSE. The special mechanical workshop for the production of two types of special munitions (250 and 500 gauge aerial bombs) was also located at MSE. Other types of indigenously produced special munitions were manufactured by general purpose establishments, Nasser State Establishment (R-400 aerial bombs), State Establishment for Mechanical Industries (DB-2 aerial bombs) and Project 144/2 at Taji (special missile warheads and warheads for 122-mm rockets). Project 1728 (project 144/3, Mutawakeel project) Production of Al Hussein class missiles (engines) Most buildings were damaged or destroyed during the war. No actions were taken by UNSCOM to destroy the infrastructure. The facility was under UNSCOM monitoring.